During the 1850's in Europe, bilbo catchers or bilboquets became quite the rage for entertainment. 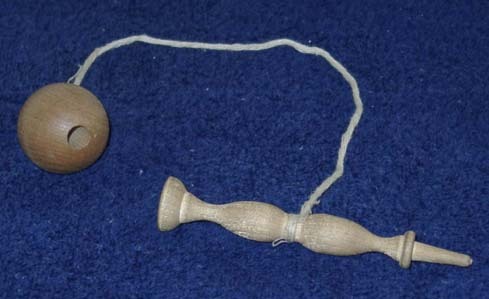 The one shown here is of similar design and the principle is like the ball and cup. On one end of the shaft, the ball is caught in a shallow depression, requiring considerably more practice than in the ball & cup shown above. On the other end of the shaft, the hole in the ball is stuck on the pointed "spike" of the shaft. For those that thing the action cannot be done, we watched an interpreter at a historic site succeeding about 60 percent of the time on the cup end and about one out of three times on the spike end.